Install Rover Algorithm on a rezzed piece of ice as a hosted condition counter with the text "Host ice has +1 strength for each power counter on Rover Algorithm. Whenever the Runner passes host ice, place 1 power counter on Rover Algorithm." 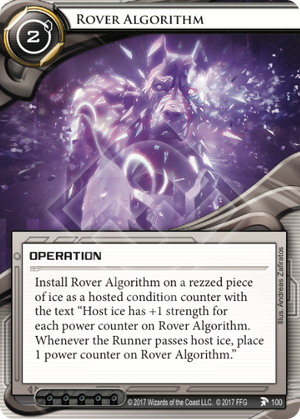 If the ice hosting Rover Algorithm is derezzed, does Rover Algorithm still gain power counters when the Runner passes that ice? Yes. The ability is on the condition counter, which remains active even while the ice is inactive. Quicksand for the masses. Rover Algorithm lets you upgrade any ice so that it grows in strength the more the runner goes through it. It's ideal for making gear-check ice on heavily run servers (HQ, R&D) scale into the late game. The actual impact on the game depends a lot on the strategy your opponent is playing. A player which runs rarely but focuses on heavy multi-access (e.g. R&D Interface or Deep Data Mining won't sweat the Rover. A run-often player such as a criminal with lots of run evens like Account Siphon on the other hand will find that their runs will become quite costly. Because Rover Algorithm stays when the host ice is derezzed playing it on a cheap ETR barrier means that even if criminals pull their derezzing tricks you can still rerez the ice at boosted strength. On the other hand ice destruction will still work well, though Parasite of course is somewhat slowed down due to the boosted strength. There is a slight difference with Quicksand in that Rover Algorithm boosts strength after passing while Quicksand does so on encounter. So the first time the runner encounters ice with Rover Algorithm it's not boosted yet. In the long run it doesn't matter but it makes Vanilla plus Rover Algorithm even worse than it already was (two cards instead of one) compared to just plain Quicksand. Rover Algorithm conveniently is an operation, one of the easiest types of card to tutor for (Consulting Visit, Lily Lockwell). Overall Rover Algorithm is a useful card in many circumstances, it's available to everyone and has a fair price. I don't think it's overpowered but it's certainly worth considering for your next deck.